The Shaunavon Badgers have knocked off the two-time defending Whitemud Hockey League champion Gull Lake Greyhounds. The top seeded Badgers downed the second seeded Greyhounds 7-4 before a huge throng of onlookers on Wednesday evening at the CPWC. 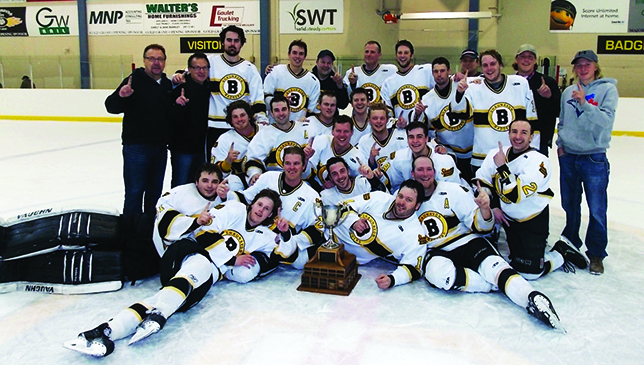 The victory gave the Badgers the best-of-three Whitemud Hockey League championship series two games to one. The Greyhounds won the opener 6-3 before the Badgers bounced back to take game two by a 5-4 count. Home ice advantage, however, was not a factor in the series until the third and deciding game. Fans packed into the CPWC on Wednesday and the 50/50 prize was a record $1,900. Logan Aasman triggered a pair of goals to spark the Badgers’ attack. Aasman’s second goal was deposited into an empty net after the Greyhounds had pulled goaltender Tyson Edwards in favour of an extra attacker. Greg Coburn tapped in the fourth goal after Aasman set it up after blowing down the left side. Evan Schafer (power play), Dawson Tangen, Kyler Sachkowski (power play) and Kyle Hardin also responded for the Badgers. In the assist department, Cody Tetrault, Evan Schafer, Greg Coburn and Dylan Bredahl each collected a pair of helpers. Shane Frey and Trevor Aadland picked up the others. “We had three well-balanced lines and everyone was committed to playing their roles,” commented Schoenroth. Power play goals were a key element of the game with six of the 11 goals scored on the man advantage. In fact, Gull Lake was very potent with the extra man as all four of their goals came via the power play. Clay Harvey was the big gunner for the Hounds as he bulged twine twice in the middle stanza. His first came at the 16:29 mark on a two-man advantage. Mason Logan put the visitors on the board at 6:31 of the second period. Cody Vaughan completed the scoring for the Greyhounds at the 6:07 mark of the final period. Mason Logan and Cody Vaughan led the assist parade with a trio of helpers apiece. Matt Jones picked up the other two assists for the visitors. Cody Schlosser was the winning netminder for the Badgers and was steady between the pipes. Riley Kornfeld took the loss in the Greyhound net and was replaced by Tyson Edwards at 11:02 of the third frame. Referees Chris Schlenker and Greg Sauer of Medicine Hat whistled down six minors to Shaunavon and four minor infractions to Gull Lake. Brendan Jones of Gull Lake presented the Whitemud trophy to Badger captain Trevor Aadland to kickoff the celebrations. Ashley Lind (president) and Tracy Bredahl (secretary/treasurer) have completed their two year stint on the league executive and the books transfer to Gull Lake for the 2016/17 and 2017/18 seasons. The curtain has been drawn on this season and fans can look forward to another Whitemud Hockey League campaign in November.